When Obama took office in 2009, the national debt was at just $6.3 trillion up from $3 trillion at the beginning of Bush’s tenure in 2001. Bush doubled the national dent in just 8 years. Obama is set to triple the national debt in less than 8 years. More than $7 trillion of additional US national debt will have been accumulated over the 8 year duration of Obama's two presidencies, which is more than the accumulated U.S. national debt of all previous U.S. presidents combined. The Total U.S. Debt to GDP ratio is now over 300%. Such debt levels ordinarily give rise to debt crises and currency crises. The ability of the U.S. to service its debt will be drastically reduced if rates move higher. Already a number of states have defaulted. The luxury of determining interest rates may not be one that the Fed will enjoy for very much longer. When rates do finally rise we may witness the default of the U.S..
With the U.S. national debt surging another $1 trillion in recent months to over $18 trillion, it is difficult to see how interest rates can be raised in any meaningful way without creating an economic collapse. This is not too mention the huge levels of private debt at every level of American society and indeed the unfunded liabilities of between $100 trillion and $200 trillion. The Japanese have no option left...as of June 2013 it is 100% sure they will have to monetize their debt and end up with Hyperinflation...it's only a matter of time before the herd looses its faith in the system. The point no return has been passed...Interest rates will go up once MATHEMATICS of compounded interest decide time has come (and compounded interest rates move exponentially or faster and faster). And as I explained during an interview with James Turk in March 2010 the danger is coming out of a corner nobody expects it will be coming from or JAPAN. Over the past years, the critical interest rate level in Japan has come down to 1% . In Europe it is 6% and falling. For Japan however, even if interest rates continue to come down (and there is less than 0.5% room left), the mathematics of compounded interest has taken over: there is NO WAY OUT. Today it is only a matter of trying to find out WHEN the accident will happen. When it does, it will have wide international ramifications. There are very few options to deal with the overwhelming debt burden in most countries: raise taxes, cut spending, increase growth, or print money. Guess which one is more likely? Inflation from currency dilution is baked in the cake and will spur further gold demand and light a fire under the price. Public debt to Gross Domestic Product - The Debt is the problem, not the economy. Once public debt is 100% and more of GDP there is a VERY SERIOUS problem. 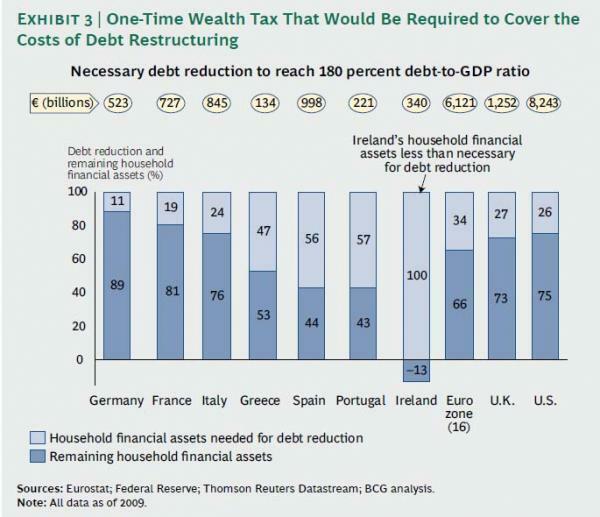 To lower Debt to 180% of GDP has become extremely difficult and in some cases (Ireland) there are simply not enough available savings. Assume you sign in or buy a Bond/Treasury yielding 3% maturing in 2020 (10 years) at 100 (nominal value) and the redemption price also is 100%. * You invest $ 10,000 x 100% = $10,000 . Each year you will receive $ 300 interest. If interest rates stay constant for the next 10 years, the market value of a Bond ABC 3% 2020 will remain the same or 100% and the nominal value paid back to the bond holder in 2020. If however interest rates rise to 6%, the market value of the 3 % ABC Bond will fall until it also yields 6% or by 50%..
Each buyer of the new issued 6% XYZ bond pays $ 10,000 x 100% = $ 10,000 and receives 6% or $ 600 interest per year. For this to happen to the 3% ABC Bond the price has to fall until each new buyer of this 3% bond also receives $600 interest per year. Hence the price of our 3% ABC bond has to fall by 50%, allowing each new investor to buy $10,000 x 50% x 2 = Nominal $ 20,000 bonds maturing in 2020 and paying 3% . [$20,000 of our 3% ABC bond now also pays out $600 per year]. If interest rates continue to rise like is now happening in Greece (12%) , your loss becomes a lot higher. Assuming the interest rates rise from 3% to 12% , the 3% ABC Bond price has now to fall until it also yields 12%. For this to happen the price has to come down to 25% . Our 1st investor (3% bond ABC maturing in 2020) now looses 75% of his capital. At 25% each new investor can again buy the same yearly yield of $ 1200. In this case he will buy a nominal amount which is four times higher: $ 40,000 nominal of Bond ABC @ 3% x 25% equals a $ 10,000 investment at 3% which yields $ 1200. 1. This is a simple calculation method. Yield to maturity is different and slightly better than what we show in our example but not taken into account as it is too difficult to explain and understand. IF we have no debt moratorium the value of our 3% ABC bond will go up by about 7.5% each year it is closing in 2020. 2. Bonds with adjustable rate or insured nominal rate are most of the time insured by some dangerous uncontrolled Derivative (Credit Default Swap). 3. To calculate the yield to maturity one must make the difference between the market and redemption price, divide it by the number of yours until maturity and add or subtract this figure from the calculated yield. For Japan the critical interest rate level is 1% : once interest rates for Treasuries break the 1% level, Japanese debt will start to grow exponentially. The manipulation of Bonds and interest rates will continue until the system falls apart..
"This is still a bumpy road," said David Schnautz, a fixed-income strategist at Commerzbank AG in London. "This kind of news is highly market-moving and any relief we see in terms of spreads tightening is vulnerable." The yield on Portugal's 10-year bond increased 24 basis points, the most since Sept. 20, based on closing prices, to5.93 percent as of 3:39 p.m. in London. That left the extra yield, or spread, investors demand to hold the bonds instead of similar German bunds at 328 basis points. Greece's 10-year yield rose 79 basis points, the most since June 15. The spread with bunds widened to 779 basis points, the most since Oct. 1. Ireland's 10-year bonds yielded 408 basis points more than similar bunds, up from 393 yesterday. Portugal's government and the opposition Social Democrats broke off talks on the 2011 budget proposal, which include plans for the deepest cuts since at least the 1970s. There's "no possibility of continuing" negotiations, Eduardo Catroga, a former finance minister who represented the rival party in the discussions, said in Lisbon today. Prime Minister Jose Socrates, lacking a parliamentary majority, needs the largest opposition party to back the budget or abstain for it to be passed. The Social Democrats have opposed tax increases and called for deeper spending cuts. Portugal sold 611 million euros ($843 million) of bonds due in 2014 today, attracting bids equivalent to 2.8 times the amount offered, down from 3.5 times in September. The way Government debt exploded over the last 10 years and the interest rates were pushed down at the same time, is nothing more but a big HOLDUP of the savers. Already in 2001 we started to advise our friends to get into Gold (and out of fiat paper money and bonds). Bonds, Gilts and Treasuries are nothing more but an option to buy worthless fiat paper money. Within the next 12 months, the U.S. Treasury will have to refinance $2 trillion in short-term debt. And that's not counting any additional deficit spending, which is estimated to be around $1.5 trillion. Put the two numbers together. Then ask yourself, how in the world can the Treasury borrow $3.5 trillion in only one year? That's an amount equal to nearly 30% of our entire GDP. And we're the world's biggest economy. Where will the money come from? Government is growing the very Monster who will destroy itself in the near future. No Government has ever paid off its debt. Government by increasing its debt consumes all productivity of the country. In order to keep things going it wages a war against it own manufacturing system and citizens by increasing Taxation, Regulation and Inflation. As Capital is leaving the country they even go after Capital which is being hidden in countries like Switzerland and other Tax Heavens. But as long as the domestic situation doesn’t improve Capital continues to leave the country and so further reduces the economic growth. This leaves the Government with a greater deficit and even more must be borrowed and more taxes must be voted into place (Green Taxation is better digested). It now has become a vicious circle. This pattern will continue until the system collapses like the USSR and China did in 1989 and Zimbabwe beginning of 2009. As the system collapses it takes no prisoners and ‘all bond holders’ loose their savings. Bonds and Fiat Paper money being the same ‘Assignats’ the latter also looses its value and we have hyperinflation until it is replaced by another instrument which is accepted by the market and a fresh cycle starts…. In the past not only did we see Bonds loose their value because of Hyperinflation (Weimar, Zimbabwe) but in the end and even if we did not have a cycle of Hyperinflation, Government repudiated on their debt or debt was erased like it was in Zimbabwe beginning of this year. Such even happened with Gold edged (Gold guaranteed) bonds issued by the USSR and China decennia ago. Today it is simply not safe to keep your savings in Bonds. Not only do they pay a negative yield because the Real Interest Rate is lower than the Inflation rate but Bonds are also (because of manipulation by the Central Banks/Authorities who are keeping interest rates artificially low) extremely expensive. Similar conditions apply to Bank deposits and Savings accounts and to any Fiat Paper Money kept under your mattress. Even worse is that similar conditions apply for Life Insurance companies, Insurance companies and Pension Funds as these are legally obliged to invest the largest part of their reserves in (Government) Bonds. Not only will the amount of retirees increase dramatically as Baby Boomers become inactive but the means to receive decent retirement payments are being eaten away by the REAL situation or Negative Real Interest Rates and Real Inflation. To be safe one in fact must keep his wealth in REAL ASSETS: commodities, Equities, Real Estate, Gold and Silver (see our investment roster) and anything which is not Paper Money, Paper bonds or guaranteed by these. 2009 Government Bond auctions are failing all over the Western world. German bond auction failed in a warning for governments to raise record amount of debt to stimulate the economy [January 7, 2009] and Britain suffered its 1st failed Gilt (government bond) auction since 2002 [March 25, 2009]. In the USA the Fed is done the same and plans to monetize $ 1050 billion by buying treasuries and Mortgage bonds. Watch the parabolic runaway on the P&F chart....January 20 the bond bubble has busted. Bonds will fall back to where this move started in the first place. It only may take some time as the authorities have opted for Quantitative Easing and are printing the money they use to buy the bonds with. As a direct consequence, the Bond markets won't be affected by the huge demand of the Authorities for funds. Additionally, many mortgage owners see the finance cost of their homes lowered. This should take some steam off the Real Estate markets. The rise of interest rates is delayed, but for how long? Expect sooner or later the hyperinflation will push them up strongly. Bonds are a loose-loose situation. Bonds ain't better than fiat paper money. Basically both are equally DANGEROUS government debt. In the 1920's-30's most European countries held a moratorium on their debt hereby chasing huge quantities of capital to the US. President Roosevelt had no other option left but to call in Gold and devaluate the Dollar by 40%. Bonds are either the subject of a moratorium or their value is inflated away. Who in their right mind would flee to bonds when the Fed is in the process of bailing out Wall Street? Does nobody remember what happens over and over again with Government debt? Buffet is 100% OUT of US treasuries. He knows what is coming. We know it too! Bonds are a loss-loss situation. In a hyperinflation, the financial markets break down and bonds become worthless. In case of a deflation, the Authorities repudiate their debt by a Moratorium. 2008 there is a huge quantity of government debt building up in the pipeline, and the government bonds due to be issued in the fourth quarter and early next year will only add to the problems some countries are facing, and particularly those countries like Greece and Italy who already carrying large amounts of debt that needs to be refinanced or rolled over. It has been estimated that European government bond issuance will rise to record levels of more than €1,000bn in 2009 (30 per cent higher than 2008)! 2009 it has become clear that ALL GOVERNMENTS will use Quantitative Easing = Print money to finance their deficits. Quantitative Easing = monetization of DEBT or the Authorities are PRINTING money to pay the bills. 30 Year Bonds will tell us when the Hyperinflation takes off. The important level is 4.3%..right where we are NOW. Break it and kiss the Bonds good-bye. Interest rate cycles last on average 25/27 years. Last time the interest rates bottomed was in 1981. Add 27 and you have 2008 or exactly the last top of the Bond market. Once the Bond market wakes up, it will be Game over. Important levels are 3,40% for 10 year yields and 4.30% for 30 year yields. Interesting is that once again the British Gilt market (treasuries in the UK used to be gold guaranteed in the old days...and this gave them the name GILT) is a precursor of what is happening in the USA and also in the EU. The world is going to need to find $5 trillion to finance government debt issuance. Additionally we need to fund private business (Corporate debt) and consumer debt. Where is all this money going to come from? The soaring bond yields and mortgage rates will wreak havoc on the debt-imbued economy. Already we saw a report by the Mortgage Bankers Association showing a drop of 16% in the Refinance and Purchase Index for the week ending May 29th. For an economy that has a total debt to GDP ratio of 370%, we can also expect dire repercussions in everything from credit card loans to municipal bonds. Authorities can only control (manipulate) interest rates so long...In the long run the market forces always kick in. In an economy saddled with fractional reserve banking, commercial banks are guaranteed by a central banks willing to buy any debt securities and to provide other loans at below market interest rates (with money the central bank creates out of nothing) the market restraints are replaced by opposite forces. Worse is that artificial low interest rates discourage savings and encourage borrowing on the part of the public and encourage consumption. This is exactly the opposite of what should happen in a sound economic system. Massive borrowing makes credit less available to already overextended consumers. By the time the buildings (real estate) and capital equipment (China, India) are completed, the consumer has run out of steam. Inventories pile up. Production is cut back. Capital good (HOCG) orders are cancelled. Factories are closed and people laid off. Consumer demand falls even more. Everyone has liquidity problems. The credit boom has become a depression. The depression also reduces the tax revenues of government at a time where government expenditures (unemployment compensation) increase. In other words, the government deficit grows mightily at the very time where consumers and industry are squeezed financially. Because of a hike in demand for money and credit, interest rates soar in a cycle of hyperinflation and Bonds and fiat money become worthless. A German sovereign bond auction failed on Wednesday as investors shunned one of the most liquid and safe assets in the world in a warning for governments seeking to raise record amounts of debt to stimulate slowing economies. The fate of the first Euro zone bond auction of 2009 signals trouble ahead as governments around the world hope to issue an estimated $3,000bn in debt this year, three times more than in 2008. American bankers are so fearful of a replay of the 1930's Great Depression, they've finally reached the point of "No-return," - lending $30-billion to Uncle Sam at a rock-bottom interest rate of zero-percent. Demand was so great at the last auction; the Treasury could have sold four-times as many T-bills. If short-term T-bill rates go negative, frightened bankers would effectively be paying the US Treasury. for the privilege of lending money to it! The last time short-term T-bill rates went negative was during the Great Depression, when frightened bankers were effectively paying the US Treasury for the privilege of lending money to it! · Borrowing requirements. Treasury borrowed over $1 trillion in the year to September 2008; it is expected to borrow close to $2 trillion in the year to September 2009. That’s 13% of US Gross Domestic Product. Not all of this is deficit; about $500 billion is refinancing and another $500 billion is for bailout schemes, some of which the US taxpayer may eventually see back. Still, in terms of GDP that’s far more debt than the US capital market has ever been asked to absorb, other than during World War II. At some point, “crowding out” must occur; we certainly cannot assume that Asian central banks will want to take the entire load, at interest rates less than zero in real terms. · Inflation. The Fed appears to believe that the current recession will bail the United States out of its inflation problem. The example is given of Japan in the late 1990s, after which the Fed explains that they will avoid the mistakes of the Bank of Japan, thus preventing damaging deflation. Actually that seems to be wrong on two counts. The main mistake in 1990s Japan was not monetary but fiscal; government spending was allowed to expand inexorably, producing ever larger and larger deficits. That mistake appears to be only too likely to be repeated here. The difference is that the United States currently has a 1% Federal Funds rate and 5% inflation, the approximate opposite of Japan in the early years of its slump. With M2 money supply (the one the Fed will divulge) up at an annual rate of 18.3% since the beginning of September it seems likely that inflation will accelerate – as it did in the recessions of 1973-74 and 1979-80. Rising real rates of return. The yields on Treasury Inflation Protected Securities have already risen from just over 1% to nearly 3% since the beginning of 2008. Given the excess of bonds coming to the market, it makes sense that real yields should rise. That in itself suggests that conventional Treasury bonds are hopelessly overvalued – with the 10-year TIPS yielding 2.82% and the 10 year Treasury 3.78%, the implied rate of US inflation over the decade to 2018 is 0.96% per annum, for a total rise in prices by 2018 of less than 10%. If you think that’s likely, I can get you a deal on Brooklyn Bridge! Thus Treasury bond and other prime bond yields can be expected to rise sharply in 2009. This will cause losses to their holders. To the extent that such holders are foreign central banks, the United States probably doesn’t need to worry. Foreign central banks have been gentlemanly holders of US debt through periods such as 2002-08 when the dollar has depreciated; a rise in interest rates simply gives them another way of making a loss. Personally if I were the Chairman of the People’s Bank of China and Treasuries had lost me the kind of money they have in the last five years I’d probably declare war on the US, but fortunately central bankers are a phlegmatic and tolerant lot! Yields are at historic low levels.